Description: Since China's reform and opening up started in 1978 and Vietnam's Doi Moi reforms were initiated in 1986, these two East Asian economies have adopted capitalistic models of development while retaining and reforming their socialist legal systems along the way. Tracking the trajectory of socialist laws and their legacy, this book offers a unique comparison of laws and institutional designs in China and Vietnam. 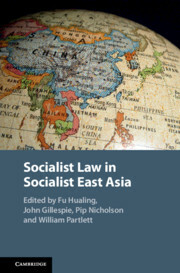 Leading scholars from China, Vietnam, Australia and the United States analyze the history, development and impact of socialist law reforms in these two continuing socialist states. Readers are offered a varied insight into the complex quality and unique features of socialist law and why it should be taken seriously. This is a fresh theoretical approach to, and internal critique of, socialist laws which demonstrates how socialist law in China and Vietnam may shape the future of global legal development among developing countries. Professor of Law and Associate Dean at The University of Hong Kong. Professor of Law in the Monash Business School at Monash University, Victoria. Professor of Law and Dean at Melbourne Law School, University of Melbourne, Australia. Associate Professor at Melbourne Law School, University of Melbourne, Australia.